Executive, non-smoking, vacation home. 2000 square feet. Jacuzzi dip pool. Just a 15 minute walk to the most beautiful beach on the Pacific Ocean. Walk on the beach to the town of Samara, where you'll find grocery store, post office, police, Doctor's Clinic, pharmacy, internet cafe, many shops and restaurants. Dine on the beach on fresh catch of the day - Red Snapper, Dorado, shrimp or 'langosta'. 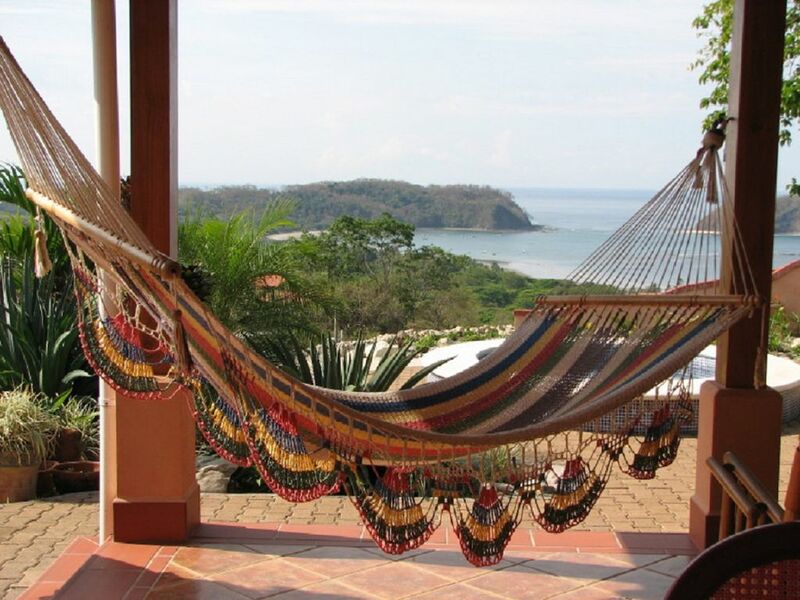 Enjoy panoramic views of the Pacific Ocean, including Samara beach, Isla Chora and Punta Indio. Samara has a coral reef making the beach area safe for swimming and excellent for watersports. 5 minute drive to uninhabited Carrillo beach. Play in the local tide pools and experience tropical acquatic life. Everyday is a beautiful summer day. We built this spacious home for ourselves but do not use it year- round, which gives you an opportunity to share our dream. All furniture is from Sarchi, pottery from Guatil, and beautiful finishings of teak ceilings and use of guanacaste, cedar and other Costa Rican woods, comfortly envelopes you in the feel of this country of diversity. Your tranquil retreat will not be shared in seclusion. Timid Howler monkeys and an abundance of birds will remind you that you share their space. The array of flowers in the gardens attract a multitude of butterflies and hummingbirds. View wildlife from the comfort of the wide, covered terrace that surrounds the house while relaxing in rocking chairs, hammocks, or at the outdoor tables. Across the road from this property is coastal jungle, and a quiet-use canopy tour. The house has ceiling fans throughout, a septic system, and safe, drinkable cold and hot town water as well as filtered water. North American high standards of construction were used. Two hours drive to Liberia International Airport; four hours to San Jose. City of Nicoya is a half hour drive away; with hospital, banks, supermarkets, clothing, restaurants, Friday afternoon fruit and vegetable market,etc. All paved roads to within last hundred meters to our property. Retired snow birds in 2004. Built our dream vacation home and we are willing to share that with you. Come and be part of the dream. Samara has the greatest beaches, the best climate and great wild life viewing. Panoramic views of the Pacific and beach. New wildlife every walk and great people to share it with. NETFLEX 1000'S of movies and video at your figure tips. This is a lovely property, with a fantastic view! My husband and I stayed her with our 2 teenage kids (16,13) 12/21-12/24/17. It is well equipped for cooking. The rooms are spacious and everything is open air. This is a tropical climate and there are alot of bugs/insects/ants and giant beetles. If this sort of thing bothers you, you should stay at a resort. The property is a ways out of town. We did not have a rental car and when I had queried Alex re: transportation, they said it was a 20 min walk to beach. It is actually quite far to town, so a car is MANDATORY if you want to stay here. There is a National Car rental in Samara. We ended up renting 2 Quads (ATV's) which also worked great but not ideal for groceries, etc. There is a pristine beach if you go south to Carillo (instead of north to Samara). There are towels and beach chairs at the house but, again, you would need a car to transport. One of the cool things about this property is it's location up on the hill. It lends a sort of rural, untamed feel to it. You hear howler monkeys in the morning, there are stray horses wandering around. Large iguanas sun on the roof, clacking there nails on the ceramic tiles. You mustn't leave food out, or you will have unwanted guests. However, nothing beats coffee on the veranda in the sunshine looking at that view! Note to Alex: the AC unit in the middle bedroom leaks and we had to put a bucket under it, as there was a giant pool of water in the am. Also, check out was a little unclear. We were supposed to check out at 11 am and had arranged for our driver to pick us up at that time. However the cleaning crew showed up at 8:30 am and wanted to start cleaning while we were still there, needing to shower and pack. If this is a normal occurrence, it is tacky and rude. However, it was Christmas eve and we assumed they wanted to get their work done to be home with family. Also, it was very confusing trying to get keys to Melissa. She told me she would meet us on the road at 11 am but she didn't show and we had to drive into town to drop keys off. In future, just have a plan when checking in how to get keys to her when you leave. I would definitely recommend staying at this property. I hate to review Casa Pastor since it is a gem that we want to keep to ourselves. From the moment we arrived, we thought we were in paradise. The house is beautiful, the layout was open and airy and allowed us to enjoy the beautiful view. We had two college age kids and on one or two days, they were content to just hang at Casa Pastor. We loved it's location up the hill and the secluded woods behind it. We loved the monkeys, birds and lizards. Additionally, both the gardener and housekeeper were gracious and helpful. Samara is, of course, wonderful as well. This is not for people who want an American resort...it is more genuine than that! Enjoy! We enjoyed a perfect 10 vacation with my family of 4 with 2 teenage girls. The house was amazing - VERY comfortable, well equipped, spacious and spotless. Samara has everything needed to keep us all well entertained for the week. We only wish we could have stayed longer. Thanks to Alex and Carol for sharing and to their property manager Melissa for making sure everything was in order!! The house was very clean - even more so after the gardener arrived. I believe we may have been the first guests for the dry season. We did not find the kitchen well stocked. Many of the pots and pans were not in a safe condition to use. That is to say the non-stick coating was badly peeling. The ingestion of such coating has been linked to increased risk for cancer. The knives were in bad condition and very dull. The kitchen lacked basic necessities such as salt and pepper. We called the manager and she told us the house did not provide salt or pepper. So we purchased these and left them behind for the next guests. The towels and linens could use updating. I almost cried the first night because the mattress was poor, but we got used to it. I don't have many opportunities to travel abroad and I really try to make the most of my limited vacation time. I was hoping the house had been up to higher standard. The views are beautiful, but it is quite basic. I thought I would write this review so future renters will have the right expectations. We did love the compost bin in the kitchen. Of course the splash pool is lovely. The backyard is private but there are neighbours. This was another disappointment because I did not expect any neighbours and thought we would enjoy total seclusion. Maybe I misread the website, but that was what I was led to believe. Occassionally we heard the neighbours fighting/drama and many times we could hear them operating power tools, doing construction, or burning yard waste. It really wasn't the natural paradise we were looking for. Finally, a few of the fans were busted or would swing wildly when operated. This meant we could not enjoy the porches at night because we could not blow the mosquitoes away. In general, we found the house to fall short. Here are the issues answered: First mentioned problem – there was no salt and pepper. While we leave consumables for renters as do most renters as we don’t stock them. I presume other tenants used them all -the Teflon on the pots are separating – why not use our supplied stainless steel ones? The bed was not comfortable – we use the bed ourselves it is fine; no other tenant has ever mentioned it. Things need updating etc.etc. what can we say everything is fine. The neighbours fight. The neighbour to the west was not there. On the east you cannot even see them because of the forest. We never hear them. We value our privacy greatly. The fans are working perfectly fine we sit out at night ourselves with them on and there are no mosquitos in December as it is the dry season. This is our retirement home so we are always trying to make in better both for tenants and ourselves. We enjoy sharing this opportunity with others. Fabulous place with a great ocean view! Stayed here with my family including two young nephews and we all were very pleased with Casa Pastor! Thank you Alex and Carol for sharing your piece of paradise! We especially love the howler moneys when they were close by. scuba diving, canopy tour, inter-country airstrip 30 min, Within one hour: take a boat tour on the Tempisque River estuary beside Palo Verde National Park and view the bird life, woodstorks, eagles and pink spoonbills abound. Also one hour away: take a 3hr return hike in Barra Honda National Park to explore the caves; guides can explain about the flora and fauna (including monkeys and blue morpho butterflies) as you hike up to the beautiful 'mirador' on the way to the caves.